The Army began researching nonnuclear means to intercept and destroy ballistic missiles during the 1960s. The so-called "hit-to-kill" technologies included infrared homing sensors that would permit an interceptor to guide itself into the path of an incoming warhead and collide with it. The Army began a technology demonstration program in the mid-1970s to validate emerging technologies to enable nonnuclear, hit-to-kill intercepts of Soviet ballistic missile warheads in space. Planning for the HOE program began in 1976, and a contract for the Development Program interceptor was awarded in August 1978 to Lockheed. The HOE interceptor consisted of surplus Minuteman I launch stages, carrying the "homing and hill" vehicle. This vehicle included a divert and homing propulsion section, a long-wave infrared sensor, a fixed-fragment-net hill mechanism, data processors, and vehicle control equipment It also carried equipment to aid test monitoring and measurements. The fixed-fragment net was tested as a means to extend the lethal radius of the interceptor. Deployed shortly before intercept, it consisted of 36 aluminum ribs with stainless steel fragments that expanded the interceptor's size to provide greater assurance of hitting the target. Beginning in 1980, HOE developers were facing problems in fabricating and calibrating the infrared homing sensor for the HOE interceptor. Several months prior to the scheduled first flight, a worst-case analysis showed sensor performance might prove marginal. The U.S. Army's Homing Overlay Experiment (HOE) first demonstrated the concept of exoatmospheric hit-to-kill. The program, which spanned the period of Fiscal Years 1978 to 1984, consisted of four flights tests in February 1983, May 1983, December 1983 and June 1984. It demonstrated the principle of hit-to-kill using a very capable, albeit expensive, heavy and sophisticated kill vehicle. 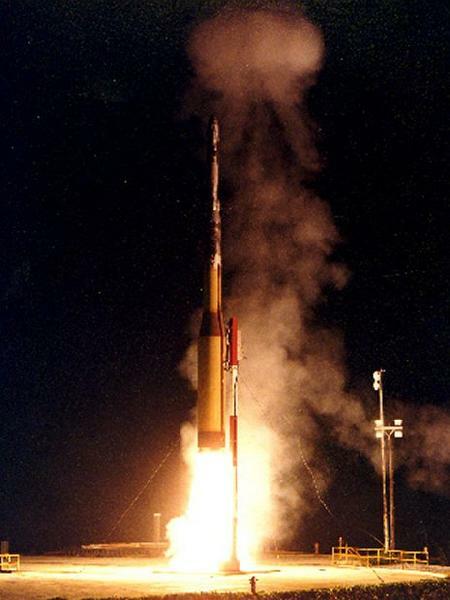 Each test involved launching a target from Vandenberg Air Force Base, California, and a HOE interceptor from the Kwajalein Missile Range in the Pacific. In June 1984, the Army conducted the fourth in a series of tests to demonstrate that a ballistic missile defense interceptor could find an intercontinental ballistic missile (ICBM) reentry vehicle (RV) in space, guide itself to an intercept, and destroy the target through the force of collision. The tests, part of the Homing Overlay Experiment (HOE), had not produced a successful intercept in the first three tries. After the fourth and final test, called HOE 4, the Army announced a successful intercept. This occurred 2 months after the Strategic Defense Initiative was chartered to expand research in these and other ballistic missile defense technologies. In September 1993, DOD acknowledged that there was a deception program associated with HOE. The deception program was started in hopes of affecting Soviet perceptions of U.S. ballistic missile defense capabilities, according to records. Deception was seen as a means of impacting arms control negotiations and influencing Soviet spending. The proposal and contingency plan to use deception evolved in late 1981 and early 1982, after the design and fabrication of experimental hardware had begun. The Secretary of Defense said the deception was discontinued prior to the final test, and so it did not impact the test's outcome. The planned deception was to explode the target if the interceptor failed to hit it but passed close enough to support the appearance of a hit. The Army terminated the deception program in September 1983, prior to the third HOE flight. DOD said, in September 1993, that Congress was not informed of the plan. No statutory requirement existed in 1984 for DOD to inform Congress about special access program activities. Legislation has since required reporting of such programs, starting in 1988. Records indicate that the contingency deception plan had been in place for the first two tests but did not affect their outcomes.Records of the deception program for HOE show that it was superimposed on the ongoing technical program after the demonstration hardware had been designed and fabricated and that it was discontinued before the third flight. No deceptive explosion occurred on flights 1 and 2 because the interceptor missed the target by too great a distance. The plan was dropped prior to HOE 3. Analyses of HOE 4 test data are consistent with the Army's conclusion that the interceptor and target collided. Records also support the conclusion that the interceptor was guided during its final maneuvers by its onboard infrared sensor. While some hardware related to the deception remained onboard the target, it did not affect the outcome of HOE 4. The hardware to implement a deceptive explosion did not interfere with a normal test intercept. Both the interceptor and target had sensors that transmitted data to the ground. In addition, test data were gathered by ground-based radars and airborne optical sensors. The data show that the target was destroyed by collision with the interceptor and not by an explosive charge after a near miss. Lincoln Lab's 1984 analysis estimated target fragment sizes ranged up to 10 centimeters, which would not be consistent with the deception plan's explosion scenario. An initial brief flash is attributed to a body-to-body collision, and the creation of a hot plasma is observed. A second, less intense flash, which persists for 6 seconds, is attributed to a fireball from vaporized portions of the target and interceptor. Available evidence supports the conclusion that the interceptor was guided to the target by its onboard infrared sensor. While there were allegations carried in the press that a radar beacon on the target broadcast its location to the interceptor to rig the test, the records of the technical program and deception plan did not suggest alternate means of guidance. In addition, alternate beacon guidance appears implausible because the interceptor guidance hardware required could not be concealed from a test team and would likely have been equal or more costly and risky to develop than the infrared sensor. The target was appropriate for this demonstration. However, steps were taken to make it easier for the interceptor's sensor to find the target, DOD'S statements in 1984 and 1985 about the success of the test fairly characterize the performance of HOE 4 but do not disclose the enhancements of the target's infrared visibility to increase the probability of detection. The selection of the target was reasonable. The target had characteristics similar to a very large Soviet ICBM RV, a primary threat to Minuteman silos at the time of HOE. This type of RV remains a threat today of suflkient importance to have been the subject of negotiated reductions in the 1991 Strategic Arms Reduction Talks. The target selected had been developed to support U.S. testing and had been previously used in both radar and infrared sensor tests. Laboratory officials responsible for these targets explained that the RV was designed to behave thermally like a modern ICBM RV, providing a similar long-wave infrared signature. Late in the program development, the Army decided to enhance the target's infrared visibility due to uncertainties over sensor performance. The enhancements were the result of (1) flying the target in an orientation that presented its side toward the interceptor and (2) heating the target to 100 degrees Fahrenheit prior to launch. These enhancements resulted in an infrared signature closer to the high end of the range of expected threat signatures. The target radiated about 10 times more IR [infrared] energy than that expected from today's Soviet RV [reentry vehicle]. DOD While enhancements of the target's infrared signature weakened one part of the demonstration, some believed it was a reasonable decision for this early technology demonstration considering the alternatives of (1) risking failure of the entire experiment or (2) investing additional time and money improving the sensor.